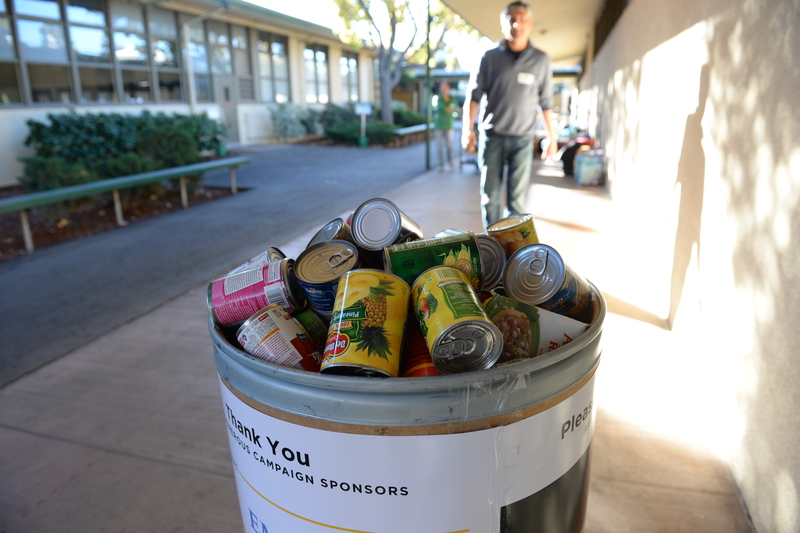 Each year around Thanksgiving, the middle school kicks off the holiday season with its canned food drive. With the “season of giving” now behind us, Lorena Martinez, BEST director for the middle school, reflected on the success of this year’s drive, which was hosted by the Service Club in conjunction with Second Harvest Food Bank. “Last year, millions of Americans lived in homes without enough food to eat, some of them in our own backyard,” reported Martinez, noting that canned and non-perishable food items were collected in containers located in advisory rooms throughout the Blackford campus. At the start of the drive, Martinez had told the students, “if we collect 5,000 cans, approximately 10 cans per student, Mr. Hathaway and I will dress up as turkeys before Thanksgiving break!” Although they didn’t meet the 5,000-can challenge, students felt great about helping those less fortunate during the holidays. “It’s wonderful to be able to have fun while helping out those less fortunate. … Together we can make a difference in someone’s life,” noted Martinez. In other news, middle school students also are collecting toiletries and assembling packets to take to a local women’s and children’s shelter. This project will continue throughout the school year.